Location: East Alma St. and 10th St., San Jose State University, San Jose, Calif. 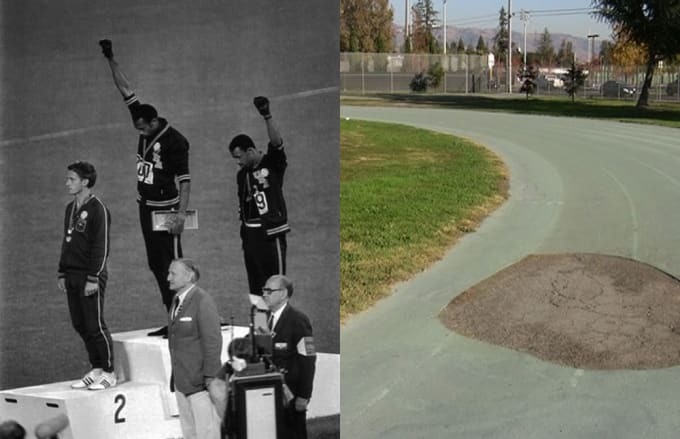 This is the track where San Jose State University students John Carlos and Tommie Smith trained before participating in the 1968 Olympic Games. At the Olympics, Carlos and Smith became famous for collecting their medals shoeless, wearing black socks that represented black poverty. Both intended to wear black gloves as well, but Carlos forgot his. Fellow medal-winner Andrew Norman of Australia suggested that Carlos wear Smith's left-handed glove, putting a twist on the iconic Black Power pose. All three athletes wore Olympic Project for Human Rights badges, as Norman empathized with Carlos' and Smith's silent protest. As "The Star-Spangled Banner" played, Smith and Carlos delivered the defiant salute with their heads bowed, creating an image that would be forever immortalized in the world of sports, as well as the Civil Rights Movement. San Jose State abandoned its famed track and field program in 1988, and the Tartan track on Winter's Field (named after legendary coach Lloyd "Bud" Winter) is now a grassy track fallen into disrepair that sometimes serves as additional parking for Spartan stadium.